Hemis monastery, known as one of the most ancient monastery in Ladakh. Hemis monastery representative reincarnate of Buddha. Hemis Gompa is one of the most important in Ladakh quite apart from its annual festival. You can gain an impression of the extent of the monastery area by climbing the so called eyrie, a hermitage (Gotsang Gompa) reached by one hour, three km climb to 3900 meters. 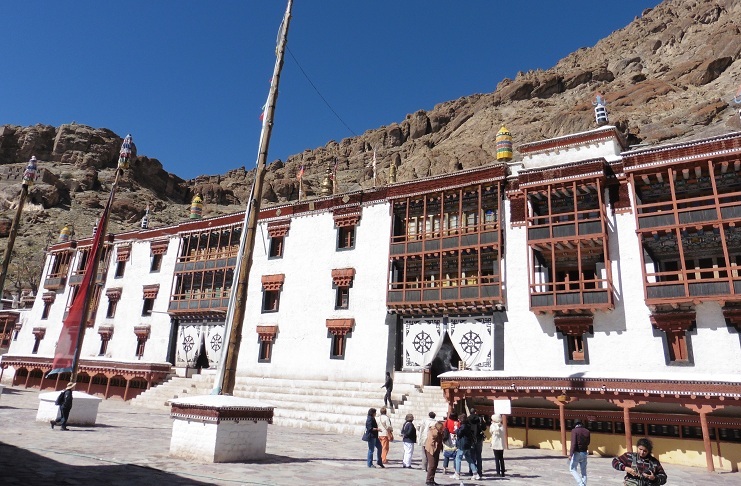 The 13th century monastery pre-dates the Hemis Gompa and was built by Syalwa Gotsangpa. There are about a dozen monks living there. The thousand square meter courtyard of the Hemis Gompa is entered from the north-east. The two prayer flags, in front of the first steps up to the Dukhang, form which there is a good view of the dancers during the festival. A few places are reserved for guest but it is sometimes possible to buy ‘admission tickets’ to the gallery from business-minded monks! The day before the two-day festival the part which foreigners can watch begins at 10 am with ceremonies in the courtyard. After prayers in the Dukhang the Rimpoche climbs the steps up to the courtyard, accompanied by musician monks, crosses it and takes his place underneath the gallery. The Gompa is famous far beyond the borders of Ladakh for its he is festival (Hemis Setchu or Mela of the Hemis Gompa). This takes place every year with mask dances on the 10th and 11th day of the fifth Tibetan month. This date usually falls in the second half of June although it sometimes goes into the beginning of July. Hemis also has a gigantic Tanka, one of the largest in the world, which is only displayed to the public every 11 years at the Hemis Festival. It was unveiled at the 1980 festival so it will not be shown again until 1991. The festival draws pilgrims from all over Ladakh and, since 1975, tourist from all over the world. Apart from being one of the largest in Ladakh it is virtually the only major religious festival in Ladakh which is held in the summer, when the passes are open. A monastery in Zanskar has a similar festival, with mask dances, in the summer months. Recently there have been deliberations by the monks of Karsha Gompa, the Zanskar monastery near Padum, whether mask dances usually held in the winter months should be switched to the summer. This would be a further attraction for a visit to Zanskar. Shortly afterwards the dances begin, which have as their theme the struggle against evil and infidels and the investable victory of good and of Buddhism. The Padmasambhavas Dance, which shows the conquest of the Ruta demons, is part of this dance. Other figures which the dancers represent are Yama – the God of Death, the black-hatted sorcerer Guru Trakpo – the vanquisher of all demons, and various other forms of Padmasambhavas. The sequence of the dances changes with time – often to present a different finale from for the benefit of distinguished guests! The dancing continues to late afternoon, with a brief stop at mid-day. Locals and foreigners wall where tea, soup, Tsampa, sweets and other refreshments are sold. If you wish to take photographs take account of the position of the sun when selecting your vantage point. In the crowded conditions during the dancing it is virtually impossible to leave your place. If you visit the Gompa outside the festival time you will be impressed by the stillness of the valley. You will also have the opportunity to see the various chapels. Near the Dukhang is the Lakhang, which is the first one after a small set of steps from the yard. The doors are placed inwards so that the front room stands behind, its roof supported with four poles. The side walls of this front room are covered with partially damaged frescoes of the watchers of the heavenly directions. In the Dukhang, the general assembly room, the throne of the Rimpoche dominates the sitting places of the monks. In the Lakhang there is a large gilded statue of the Buddha Shakyamuni with blue hair, surrounded by several silver Chortens which, as in Spituk Gompa, are decorated with semi-precious stones. There are also beautiful frescoes on the Lakhang Nyingpo which is otherwise practically empty. The hands of the artists who prepared the gimp’s giant Tanka are revered as holy relics but Hemis also has many lesser, but still interesting, Tankas. Hemis also has an excellent library, particularly well preserved wall paintings and good Buddha figures. In the second and third storeys, near the other chapels like the Zankhang, there is the Kharrabgysal, the rooms of the Rimpoche or head lama. The Rimpoche, spiritual overland of Hemis, is a reincarnation of the monastery’s founder, Stagshang Raspa, who built Hemis in the first half of the 17th century, under King Sengge Namgyal who also established the monasteries of Chemre, Hansel and Tingmosgang. The last overload of the Gompa was a reincarnation that, as a five-year old child, was undergoing training in Tibet when the Chinese invaded. Since then the Chakzot (manager) a brother of the late king of Ladakh, has conducted the business of the Gompa. Because of the Chinese takeover of Tibet the monastery has had no communication with its Rimpoche since the ‘60s. During the 1975 festival Dugpa Rimpoche, 1 12 year-old youth, became the new Rimpoche as a new incarnation. He is at the same time the overload of the Drugpa Kagyu, one of the six divisions of the red-cap sect who, before the Chinese invasion of Tibet, possessed influence practically only in Bhutan and Ladakh. In Ladakh the Stagna and Chemre monasteries belong to this order, while Spitok belongs to the yellow-cap (Gelugpa order). Drukpa Rinpoche currently lives in Darjeeling, where he is completing his training. Hemis is easily reached by a car or jeep from Leh (5 km) but rather difficult to get to by public transport. By car you follow the Upshi road past Shey and Tikse, this is the Manli road which follows the Indus. Past the TCP checkpoint at Karu you turn to the right to cross the Indus over a new bridge and follow the winding road up towards the Gompa. Unlike many other Gompas Hemis is not visible from afar – it only comes into view when you’re right beside it. There is only one regular bus a day from Leh towards Hemis and it does not go right to the Gompa. You take the Sakti bus which departs Leh around 11 am and get down at Karu Bridge. You then have to walk up the six km road, it takes about two hours. Since the bus continues on to Sakti, turns around there and starts off on the return trip to Leh at 2 or 2.30 pm there is no way you can get up to the Gompa and back down to catch the bus back on the same day. Thus if you want to visit Hemis by bus you must plan on staying overnight at the monastery and returning the next day. During the tourist season the tourist office erects tents at Hemis for overnight visitors.